Of the best sellers, the ones with the most volts top the list. The stronger it is, the more effective and quicker the effect is. Even with these higher powered devices, you are still only delivering a low amp charge (generally between 3-5 milliamps). Since the amps are so low, there is no permanent harm inflicted upon the attacker. However, because the voltage is high, they receive a devastating shock that takes over the muscle group they are touched at. Once this happens, it's all over for them. The longer you keep the stun gun in contact, the more energy is pumped into them overwhelming their ability to function normally. These Beasts have the penetrating power to go through thick clothing and deliver a devastating electrical shock to your assailant - giving you precious time to get away. All of these high voltage stun guns give you every advantage in facing off against an attacker. 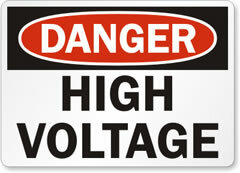 The higher the volts, the quicker the full effect, and the sooner you get away. Stun Devices can not be shipped to Hawaii, New York, Massachusetts, Michigan, Rhode Island, or Connecticut.